Foraging has been on the brain lately - gorgeous cookbook, plus my daughter's excitement. Truth is though, most of my foraging is done in my fridge and pantry, trying to use up food before it goes off. lunch - just zap a bowlful with a little extra basil pesto in the microwave for a minute; or our personal favorite brunch - a frittata... and so simple to make: Just heat a small oven proof skillet over medium high heat. Toss 2 cups of the pasta in the skillet just long enough to heat through. In the meantime, scramble 4 large eggs & 1 large dollop of basil pesto in a bowl. Pour the warmed pasta and mix well. Pour the whole thing back in the pan and make as you would any other frittata. 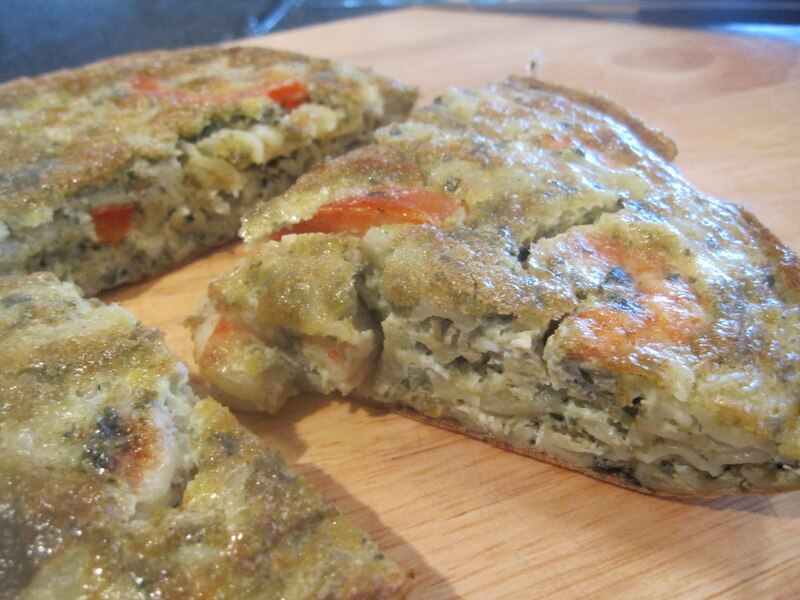 (You can find some other frittata samples here) . I'm sending this over to Claire of Chez Cayenne, this week's Presto Pasta Night Host. I do hope you plan on joining in the fun as well. 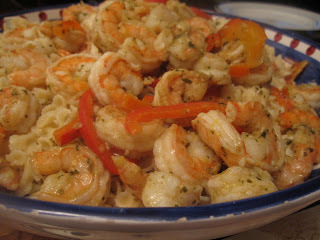 Just write a post sharing a pasta recipe, mention Presto Pasta Nights and Chez Cayennee with links to both. Then email cdmcculloch7 (at) gmail (dot) com and cc me - ruth (at) 4everykitchen (dot) com by Thursday so Claire can post this week's roundup on Friday. This post got me thinking... what is your idea of foraging? Where do you do it? And what are you hunting for? Your shrimps and bowties look so cute together, and it sounds delicious too. I want to try that. Thanks Claudia, they are a great pairing.